Federal prosecutor Charlie Beckman’s life has his existence turned upside down when a deranged homeless man calls him by a secret nickname, one known by only one other person in the world…Charlie’s brother, who went missing 13 years ago. Such is the premise of James Hankins’ new suspense thriller, Brothers and Bones. Hankins recently took time from his busy schedule to chat about what it’s like to be a full-time writer and stay-at-home dad. Q: Let’s start with what compelled you to make the transition from screenwriter and lawyer to working for yourself in the demanding role of “published author”. A: Well, the transition from screenwriter to lawyer occurred because Hollywood was more reluctant to roll out the red carpet for me than I had hoped, and I had to start paying the bills. So I became a lawyer. I loved writing, had done it all my life, and I wasn’t about to stop simply because I’d started to practice law. But because I’d moved from L.A. to Boston, putting Hollywood thousands of miles behind me, I decided to shift from screenplays to novels. I became a lawyer by day, writer by night, and when my wife and I learned we were going to have twins, we decided that one of us should stay home with them. She’s a fantastic lawyer who has always wanted to be a lawyer, while I was a reasonably good lawyer who always wanted to write, so the choice was easy. I retired from the law two weeks before our boys were born to be a stay-at-home dad who writes books. Q: How did your prior employment prepare you to take this leap of faith, and were your expectations about the transition realistic? A: My expectations were realistic because they weren’t terribly high. My hopes were always high, but my expectations were very reasonable. I’d spent years in Hollywood without making much of a dent in the place, after winning awards at one of the top film schools in the country, so I was well aware that achieving success in certain creative endeavors can be extraordinarily difficult. It’s almost freeing, to be honest, to be shooting so high that no one expects you to hit the target. There’s no pressure. If you succeed, it’s wonderful. But if you fail, everyone knows what a long shot it was anyway. It takes a lot of external pressure off. Of course, the internal pressure, the desire not only to tell my stories but to find someone willing to listen to them, never goes away. Thankfully, though, my reasonably low expectations have been exceeded by a comfortable margin. I’ve been very gratified by the reception my books have received. Q: How do you budget your time to write amidst the distractions of hearth, home and the Internet? Q: Were you a voracious reader growing up? If so, who are the authors that resonated with you and perhaps even influenced your own writing style as an adult? A: I was. I loved Richard Adams’s Watership Down. I read it as a kid and I’ve read it three or four times as an adult. It’s one of my all-time favorite books. I also loved Tolkien’s Lord of the Rings trilogy. I read the Narnia series, dozens of Tarzan of the Apes books and other Edgar Rice Burroughs adventure books, Ray Bradbury’s science fiction, Jack London’s books. I’m not sure their styles are reflected in my own, but I do see a pattern. I gravitated toward adventure stories, as so many children do, and I write thrillers today. My love for suspense and action is deep-rooted. A: I generally come up with the plot first. It starts with a small idea, a seed of a story, something that gets me thinking or wondering. When I have an idea of something interesting that could happen to someone, or an unusual situation a person could be thrust into, then I start to think about the kind of person who could impacted in the most interesting way by whatever that is. This probably comes from my screenwriting days, when story was always king, at least for the kinds of scripts I was writing. High concept stories that can grab you in a sentence. The hook for most thrillers can be boiled down to a sentence or two. That hook is usually what comes to me first, then I develop appropriate characters. That said, I work very hard on characterization, because the last thing I want is to write is a really interesting story populated by cardboard characters. Q: Tell us about Brothers and Bones, how it came about, and the influence that your previous career had on giving your protagonist a job as a federal prosecutor. 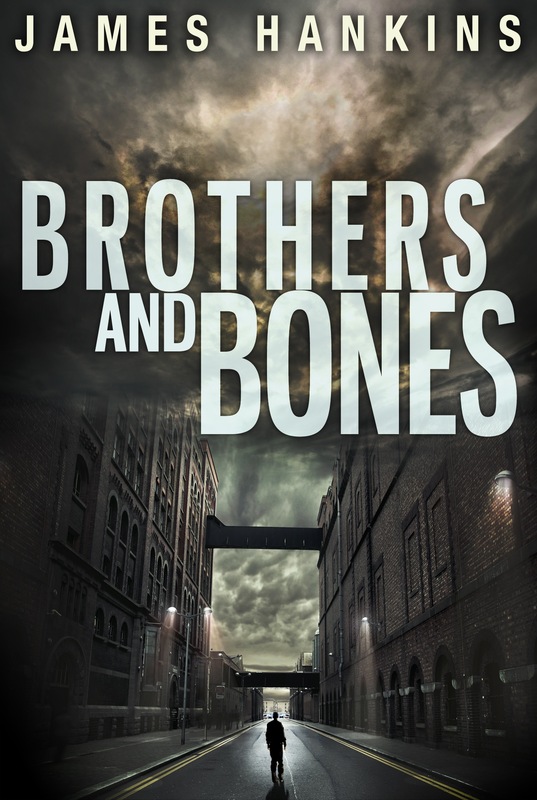 A: Brothers and Bones is about Charlie Beckham, a federal prosecutor who is on his way to court to start the biggest trial of his career when a deranged homeless man says two words to him that turn his world upside down. He calls Charlie by a nickname known by only one other person in the world—Charlie’s beloved older brother Jake, who went missing 13 years ago. Charlie has a hundred questions but loses the homeless man in a crowd before he can ask a single one. So begins his search for answers, a search that takes him into dangerous places and pits him against ruthless people. The book is a thriller, of course, but it’s also part mystery, part action, and at the core of it is an interesting “partnership” between a prosecutor and a homeless man who isn’t afraid to bend the laws as he needs to. The seed that grew into the story was planted when I was a lawyer in Boston. I’d pass the same homeless man on the street every day, near the same street corner, and he was always talking to himself as though he were arguing with someone only he could see. He’d be very focused on whatever he was saying and to whomever he thought he was saying it. One day I wondered how strange it would be if, as I passed, he interrupted himself, looked up at me, and said – very clearly and lucidly – “Hi, James,” before resuming his argument with himself. It was an odd thought that I couldn’t shake. Then I thought it would be even stranger if what he called me was something secret, something he simply shouldn’t know. What would that be? How could he know it? These questions led to more until it was a mystery I wanted to solve. I do think that my experience as a lawyer helped me write Brothers and Bones, at least a bit. Like my protagonist, I was a lawyer, but Charlie Beckham is a federal prosecutor while I was an employment lawyer—and those are two very different animals. But from my legal practice I knew what it was like to be a lawyer in Boston. I’ve been to court, and to the federal courthouse where Charlie works. I might have chosen to make Charlie a lawyer even if I hadn’t been one myself, but I’m certain that writing him was a little easier because I did practice law. Q: In Brothers and Bones, a defining moment in Charlie’s life took place when his brother, Jake, went missing many years ago. A strong sense of familial devotion is evident in the book – both in Charlie’s dedication to finding out what happened to Jake, and in Charlie’s memories of Jake’s sacrifices for Charlie as they grew up without parents. Does family play an important part in much of your writing? A: It wasn’t something of which I’ve been conscious, but it’s evident that family has played an important role in my writing to date. As you note, Charlie and his brother had a very strong bond, one that drives the story to a very large degree. In my other books there’s an importance on family, too. In Jack of Spades, my police procedural, the detective is divorced, still in love with his wife, and frustrated that he’s growing apart from his college-age son. This is woven throughout the book. And my supernatural thriller, Drawn, is about four very different people, driven by different forces — some supernatural, some all-too-human – toward a shared destiny. But each of those four characters lacks family in any meaningful way, and they all seem to be searching for it in their own ways without even realizing it. As for me, I’m the last of six kids in a very close family, so I’m not surprised that familial bonds are important to my stories. Q: Brothers and Bones is actually one of three books that you released simultaneously. What challenges did you face releasing three at once that you don’t think you would have had publishing one at a time? A: The biggest challenge was that I couldn’t promote each book equally, at least not at first. It’s hard enough to get people to pay attention to a new author at all, much less get them interested in three books at once. If I split my focus I would have done none of the books justice. I realized that, instead, I’d have to focus on one book and hope that people would like it enough to buy my others. For the most part, that has worked for me. I chose to focus my efforts primarily on Brothers and Bones because, of the three, it probably has the quickest hook to grab a reader. I love my other books, but Drawn is a supernatural story, which has a smaller audience than straight thrillers, and Jack of Spades is a cop-chasing-a-serial-killer book, which is also a subset of the larger thriller category. I’ve been very pleased to learn from reader reviews many people finish Brothers and immediately buy my other books. Of course, there are also people who start with one of the others, then buy the remaining two. Either way works for me! Q: If your favorite of these three titles were turned into a movie, who would your dream cast be? A: I love this question because I never think about this. My wife does and she’s usually spot on with her casting choices. She reads my books and tells me who should star in the movies, and she’s usually right, but I never have anyone particular in mind when I write, though I can see my characters very clearly. I can’t really pick a favorite of my books – I love all of my “children” equally, if differently – but I’ll use Brothers and Bones because it’s the one that would be most likely to make it to the silver screen. For Charlie, the prosecutor, we’d need an early thirties lawyer with a sense of humor. I think Ryan Gosling would be terrific. Tougher casting would be the quirky homeless man who starts out a little deranged but slowly regains his faculties. He’s strange and tough as nails and in his mid-to late forties. Nicholas Cage, who makes really interesting performance choices, could do it well. Q: Like many authors, you opted to go the self-publishing route on your titles. What drove this decision and what did you learn from the experience? A: I’ve had a terrific agent for years but we were never able to find a fit for my books with a traditional publisher, despite positive feedback. With the explosion of self-publishing and ebooks, it became obvious that self-publishing was the way for me to go, as it has been for so many thriller writers who aren’t already established in print. Indie publishing seems to be the way that these books are getting out to the world. I’ve definitely learned a few things, but first and foremost is that the work never ends. When the book is finally written, the marketing begins. But all authors are expected to promote their books these days, not just indie authors (though mega-sellers often have access to marketing opportunities that indie authors don’t). But what I also realized is how much control self-published authors have over their work, from how it reads, to how the covers look, to pricing, etc. That’s something that I really like. Q: What would you like readers to take away from your stories? A: Other than a burning desire to make sure they’ve read all of my books? I hope that I help readers escape – just for a while—to a new place, a new life. I want to give them a chance to walk around in someone else’s shoes for a bit, maybe to visit a place they’ve never been, to find themselves in a situation they’ve never experienced, to feel a few tingles up their spines, some excitement and thrills and a sense of mystery and discovery, as well as a sense of satisfaction that causes them, when they reach the end of the books, to say to themselves (and hopefully to all of their friends and family) that reading my books was a worthwhile way to spend their valuable time. A: I almost went with the fact that I can juggle knives (not well, but I can) or that I can recite Lewis Carroll’s wonderful poem of near-gibberish, “The Jabberwocky,” by heart…but I’m going to go with the fact that twenty years ago I got to kiss Dawn Wells (who played “Maryann” on Gilligan’s Island) on the cheek…mostly because I love to tell that story. A: Another thriller. It’s too early in the process to say more about it, but I’m working on another thriller. I’m always working on another thriller. A: I hope people visit my website – www.jameshankinsbooks.com. There’s more about me and about my books there. They can sign up for my newsletter, which I send out on only very special occasions. They can also email me through my Contact page. I love hearing from readers. Also, I can be reached on Facebook at http://www.facebook.com/JamesHankinsAuthorPage. And I’m on Goodreads at http://www.goodreads.com/author/show/6644088.James_Hankins. Finally, I want to thank You Read It Here First for this interview opportunity. It was a lot of fun. Happy reading, all!